Elevator Modernization: When is it time? Elevators have service lives that can exceed 20 years, so it’s understandable that facility executives don’t spend a lot of time thinking about their elevators until performance slips. When that starts to happen, facility executives face a question: Is it time to modernize? Deciding when to modernize an elevator isn’t easy, because the factors that may drive modernization in one facility may not be important in another. The modern elevator is a machine. In theory, it could last forever if appropriate care and maintenance was given, and parts and components were replaced on a regular basis. However, this does not mean that the elevator will always be useful, efficient, or even safe. Social needs and current technology will change, along with the way an elevator should function. This is especially apparent with changing building, fire, life-safety, and elevator safety codes. This is where modernization comes in. The process of Elevator modernization involves upgrading the critical parts of the elevator in order for it to be able to handle new technology, have better performance, improve safety, and even have an up-to-date look. Are your employees, tenants, and/or visitors complaining that they have to wait a long time for an elevator or that they spend too much time in travel once they are in? Are your elevators experiencing frequent “downtimes?” Are your elevators functioning when and the way you need them to? Modernization can increase your elevator’s performance. Is your current system over 15 years? Do you feel your current system may be consuming too much energy? Modernization can increase your elevator’s efficiency. Are you receiving complaints that your elevators are noisy or that the ride is less than smooth? Modernization can increase passenger comfort. Do your elevators look out of date or out of place with the rest of the building? 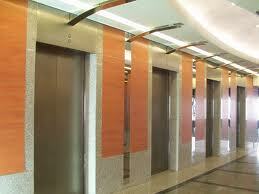 Is your elevator showing the wear and tear of years of service? Modernization can improve your elevators overall aesthetics. Do you have concerns that your elevators may not be in compliance with current codes and regulations? Do your elevator doors close on passengers as they enter or exit the elevator? Does the elevator stop level with the floor at stops? Modernization can improve passenger safety. Modernization allows you to enjoy the benefits of a new elevator without the expense. Modernization makes an elevator safer, more efficient and more attractive. As a result, the building itself gains a more modern image and inherently more value. The riders’ experience improves as well, through reduced waiting time, better comfort and improved reliability — all leading to increased confidence and greater peace of mind. We approach every Modernization project with a focus on aesthetics, functionality, cost, and sustainability. If you are considering modernization for one of your elevators, give Pride and Service a call today.